BALTIMORE, Maryland, November 29, 2010 (ENS) – A new wind energy program to facilitate siting, leasing and construction of projects along the Atlantic Outer Continental Shelf is now underway and will spin up to speed starting in January 2011. The accelerated leasing process, called “Smart from the Start,” is being simplified through a proposed regulatory change that would enable the issuance of leases on the Atlantic Outer Continental Shelf in 2011 and 2012. “To fully harness the economic and energy benefits of our nation’s vast Atlantic wind potential we need to implement a smart permitting process that is efficient, thorough, and unburdened by needless red tape,” said Secretary of the Interior Ken Salazar, launching the program Tuesday. “This accelerated and focused approach to developing the nation’s Atlantic wind resources will encourage investment while ensuring projects are built in the right way and in the right places,” said Michael Bromwich, director of the Bureau of Ocean Energy Management, Regulation and Enforcement. Bromwich said BOEMRE is proposing a revision to its regulations that will simplify the leasing process for offshore wind in situations where there is only one qualified and interested developer. The revision eliminates a redundant step, and could save up to six to 12 months in the leasing process. “We believe the regulatory change we are proposing, along with our efforts to identify priority Wind Energy Areas offshore, will result in a more efficient and coordinated permitting process for offshore wind,” said Bromwich. “As the pipeline of projects begin to move forward more rapidly, the environmental and economic benefits of offshore wind, including manufacturing facilities and associated jobs, can be realized,” said Bode. 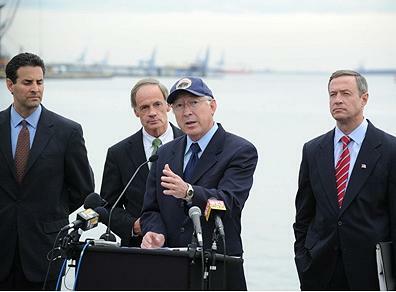 Maryland hopes to create thousands of those jobs. On November 8, the federal government accepted the planning recommendations of the Maryland Offshore Wind Task Force and issued both a Request for Interest and a map of an offshore wind leasing area in federal waters adjacent to Maryland’s Atlantic Coast. They announcement makes Maryland the second state in the nation, after Massachusetts, to reach this point in the process. Governor O’Malley has made offshore wind a priority in Maryland’s efforts to generate 20 percent of its energy from renewable sources by 2022. According to state figures, a one gigawatt wind farm off of the Maryland coast could create as many as 4,000 jobs in manufacturing and construction during the five year development period, with an additional 800 permanent jobs once the turbines are spinning. Wind Energy Areas are offshore locations that appear most suitable for wind energy development. Data would continue to be collected for these high priority areas to inform government and industry assessments and planning. Salazar established the Atlantic Offshore Wind Energy Consortium with 11 coastal state governors earlier this year. Interior officials have been working with Atlantic states to identify Wind Energy Areas. The state-federal task forces set up in eight of these states are identifying areas with generally bountiful wind energy and relatively fewer potential environmental and use conflicts than other offshore areas. Under the Smart from the Start initiative, BOEMRE will work with states to identify Wind Energy Areas off the coasts of a number of Atlantic states, including Maryland, Delaware, New Jersey, Virginia, Rhode Island and Massachusetts within the next 60 days. By January 2011, Requests for Interest and Calls for Information will be issued for these Wind Energy Areas to support lease sale environmental assessments. Maryland’s Request for Information has already been issued and those for New Jersey, Virginia, Rhode Island, and Massachusetts are being developed. Additional Wind Energy Areas will be identified in 2011 for other Atlantic states, which may include areas offshore New York, Maine, North Carolina, South Carolina, and Georgia. BOEMRE will assist in developing site assessment data and evaluating potential wind energy area leasing. In January 2011, BOEMRE will initiate regional environmental assessments under the National Environmental Policy Act to evaluate the potential impacts associated with site assessment activities in identified Wind Energy Areas in Virginia, Maryland, New Jersey, Delaware, Rhode Island, and Massachusetts. This effort will be supported by the extensive environmental studies and outreach already conducted by several of these states. Examples include the New Jersey Ecosystem Baseline Study, the Virginia Coastal Energy Research Consortium Offshore Wind Studies Report, Rhode Island’s Ocean Special Area Management Plan, and the Maryland DNR Open House outreach program. In addition, says Bromwich, there will be rapid and close coordination with other federal agencies to compile existing site assessment data. If no significant environmental impacts are identified in Wind Energy Areas, BOEMRE would offer leases in these areas by the end of 2011/early 2012. Developers will still need appropriate and comprehensive site-specific NEPA review of individual projects. BOEMRE will work directly with project proponents to ensure that those reviews take place on “aggressive schedules with frequent interagency communications and dedicated staff,” Bromwich says. There will be a public scoping period during which all interested parties may submit comments on alternatives and issues to be addressed in the regional environmental assessments. There will be additional opportunities for public comment throughout the leasing process. A full Environmental Impact Statement is likely to be required in connection with the review and approval of a wind farm construction and operations plan. To address the need for transmission infrastructure to bring this offshore power ashore, BOEMRE will move forward on a parallel track to process applications to build offshore transmission lines. This offshore wind initiative is the latest in a series of Obama Administration actions to spur renewable energy development on the Outer Continental Shelf. In early 2009, Salazar expedited the long-delayed process for approving the final rules for offshore wind development, establishing a regulatory framework that encourages responsible development. He then established the Atlantic Wind Consortium and announced the creation of an offshore wind coordinating office to expedite Interior’s collaborative efforts with the states. Key aspects of the Atlantic Wind Smart from the Start initiative are modeled on the permitting of major solar energy projects on U.S. public lands in the West, including a Smart from the Start approach that designated solar energy study areas, conducted early environmental reviews, and is coordinating state and federal permitting processes for large-scale solar projects.